This beautiful children’s book, hand autographed by the Author/Artist with the child's name is perfect for bedtime stories! The book follows the story of Olivia Ocelot and her friends in the Rainforest of Costa Rica. 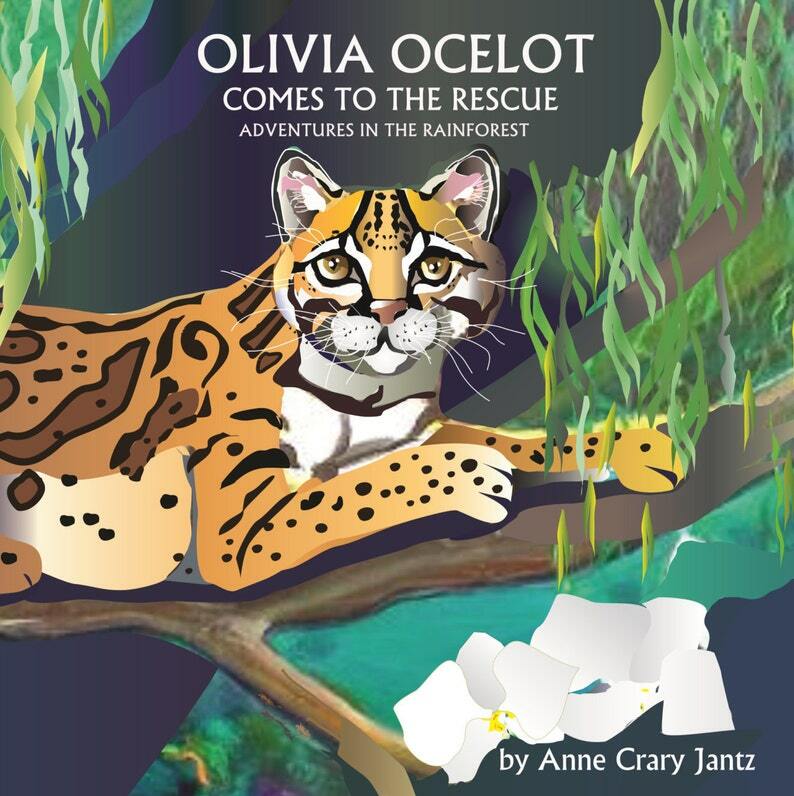 Adventurous, exciting, educational, and filled with Nature’s wonders, “Olivia Ocelot Comes to the Rescue” captures the enchantment of the Rainforest, and the rainbow colored tropical beauty of Costa Rica. Olivia Ocelot’s adventures emphasize the power of the community, and her story celebrates the friendships between some very unique animals. When ordering a book, you can personalize it: tell us the name of your child or children in your order and it will be on the title page, followed by a personalized message from the author, Anne Crary Jantz. Anne has been an artist all her life. 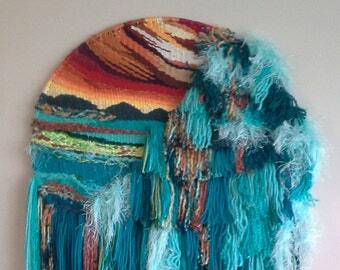 She writes and illustrates children’s books because she loves children, animals, flowers, and bright, joyful colors. Also, she never really grew up. Anne has a B.F.A. in Painting & Sculpture and a Master’s Degree in Art Therapy, both from Wayne State University in Detroit, Michigan, U.S.A. She has been an art teacher in Michigan and in Australia. Anne has lived in 7 states and 7 countries with her soul mate-husband, Bill. They live in Dearborn Heights, Michigan with Jupiter, a lovely, big, black dog with tan feet and fuzzy tan eyebrows. They have two grown children, both married with children of their own. Anne’s 5 grandchildren help plan the books. Olivia Ocelot is a perfect gift for children aged between two and twelve years old, although it’s also a great gift for a new baby or Christening keepsake. Recently I've been hearing from a lot of adults who are also enjoying this story. The book’s illustrations have been hand painted and then digitally enhanced by Anne Crary Jantz, giving a bright, colorful and vibrant look. The story content includes interesting and accurate accounts of how animals raise their babies in the Rainforest in Costa Rica. Each book can be especially autographed and dedicated to your child or children by the author. The book is 32 pages in length and is 8.5"X11". It is a soft cover book with a glossy cover illustration. When placing your order, please leave details of the personalization you require in the ‘note to seller’ box. Please check your details carefully as once the book is signed, changes can’t be made. Olivia Ocelot lives in the Rainforest in Costa Rica with a lot of other very interesting animals. They all know she is the one to come to if they have a problem, because Olivia Ocelot cares about her friends, and she is a very good detective. In this episode, Penelope Oropendola, a beautiful bird, comes to Olivia Ocelot for help. Penelope and her group of friends have a big problem. Olivia goes out and visits a lot of her neighbors, and asks them all what they think Penelope Oropendola and the others should do about their dilemma. She finally gets an answer and helps Penelope and her Oropendola community. Olivia Ocelot has come to the rescue, and she is very happy. Next, she is summoned by the dangerous and powerful Jason Jaguar, King of the Rainforest. She goes to see him with great fear and trembling, and the story comes to a happy ending. Olivia Ocelot is very, very happy.